Market Leader : News :: Что будет с золотом в марте? Что будет с золотом в марте? What should we expect in the global market of gold in March? Some experts decided to share their forecast. They remind us that gold has been good at exceeding investors’ expectations. In particular, they used to expect the price of a troy ounce of gold to stay somewhere in the $1300-1350 range in the first quarter of the year. However, gold moved above $1360/oz in January. This has been the highest level since August 2016. After retracing slightly back, the price came close to this local high again in mid-February. The reason behind this gold rally is easy to identify. The thing is that gold went up as the U.S. Dollar went down. Those 2 assets have a negative correlation most of the time. Is gold going to behave the same way through the rest of March? When it comes to answering this question, some experts seriously doubt this. First of all, the newly-appointed Chairman of the Federal Reserve promised to keep on raising the interest rate. The nearest Fed meeting is about to take place this month. Secondly, Trump’s tax reform is expected to boost the economic growth in the USA. The amount of new jobs has already been growing for a couple of months, amid decreased employment and inflation. All of that has been stimulating consumption and favoring a stronger dollar. Like we mentioned earlier, the U.S. Dollar and gold have a negative correlation, which is why a stronger dollar won’t let gold raise even higher. 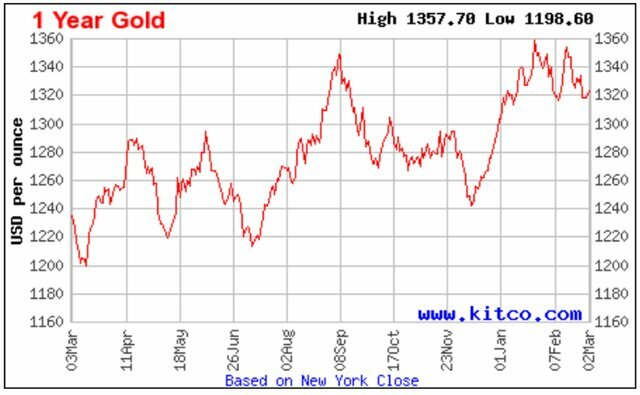 Even staying in the mentioned $1300-1350/oz range will be a big achievement for gold, given the current and future situation. However, they say that the long-term bias is bullish for gold. The thing is, the major downtrend last for 6 years and stopped last year. So, eventually, gold will get more expensive.